The division spermatophyta (Seed plants), as the name suggests, include all seed bearing plants. It has been divided into two sub divisions- gymnosperms and angiosperms. Gymnosperms (Gymno: naked, sperma= seed) include simpler and primitive plants of the division spermatophyta. They are characterised by the presence of naked ovules, borne unprotected on the surface of the megasporophylls. Gymnosperms are sometimes called as phanerogams without ovary. Gymnosperms are most ancient group of seed plants, originated in the Paleozoic era. They were dominant over the earth's surface during the Jurassic and cretaceous period of Mesozoic era. There are about 70 genera and 725 species of living gymnosperms, distributed throughout the temperate and tropical regions of the world. In India, they occur in northern mountain ranges including the Himalayas. The cone bearing plants or the conifers form the largest group with 500 living species. The common conifers are species of Pine, Fir, Spruce, Cedar and Larch. Most of the living gymnosperms are evergreen trees or shrubs with xerophytic adaptation. The main plant body is sporophytic and is differentiated into root, stem and leaves. The stem is usually erect, profusely branched (Unbranched in Cycas) and woody.Sometimes, as in Zamia, it is tuberous. presence of leaf scars on the stem is a characteristic feature of gymnosperms. The leaves are usually dimorphic. The foliage leaves are green, simple, needle shaped or pinnately compound. Scaly leaves are usually minute and deciduous. The leaves are well adapted to withstand extremes of temperature, humidity and wind due to following features. Needle like leaves reduces surface area. The roots are di-to polyarch. In the cortex of the stem tanniniferous cells are frequently present. The young stem has a ring of collateral and open vascular bundles. The xylem consists of only tracheids and xylem parenchyma, vessels are absent, with the exception of the members of the gnetales. The phloem consists of sieve tubes and phloem parenchyma. Companion cells are, however absent. The stem shows distinct secondary growth and conspicuous annual rings are present in the wood. Most gymnosperms leaves do not have lateral veins and the lateral translocation of nutrients takes place with the help of transfusion tissue. Main plant body is sporophyte and heterosporous.It produces haploid microspores and megaspores. The spores are produced in sporangia that are born on sporophyll. The sporophylls are arranged spirally along an axis forming compact strobili or cones. Strobili bearing microsporophylls and microsporangia are called male strobili or male cone. Male cones are usually short-lived. Microsporangia develop on the abaxial side of the microsporophylls. The number of sporangia persporophyll varies from two to many. 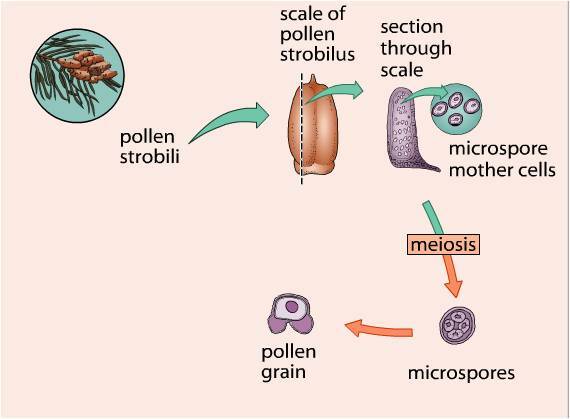 Microspores develops into a male gametophyte generation which is much reduced and is confined to only a limited number of cells..This reduced gametophyte is called a pollen grain. Development of pollen grains takes place within the micrsporangia. The cones bearing megasporophyll with megasporangia (ovules) are called as female cone. In megasporangia, the mega spore mother cell divides meiotically to form four haploid megaspores. One of the megaspore develops into a multicellular female gamerophyte that bears two or more archegonia. The male and female gametophytes in gymnosperms do not have an independent free-living existance. This is unlike bryophytes and pteridophytes where the gametophytes have an independent free-living existance. The pollen are relaesed from the microsporangium and are carried with air current to the ovules. After fertilization, zygote develops into embryo and ovules into seeds. The seeds are naked. The ovule or megasporangium belongs to parent diploid (2n) sporophyte generation. In the megasporangium, the functional haploid megaspore divides and forms a gametophyte(n) still within the ovule. Following fertilization zygote is formed which is develops into an embryo. The embryo represents the next sporophytic generation. Formation of seeds : Seeds are more resistant to desiccation and extremes of temperature.They provide protection to the embryo and also food for its germination. Formation of pollen tube : This eliminates dependence on water to bring about fertilization. Devices for seed and fruits dispersal :These plants have different devices for wide dispersal of seed and fruits. 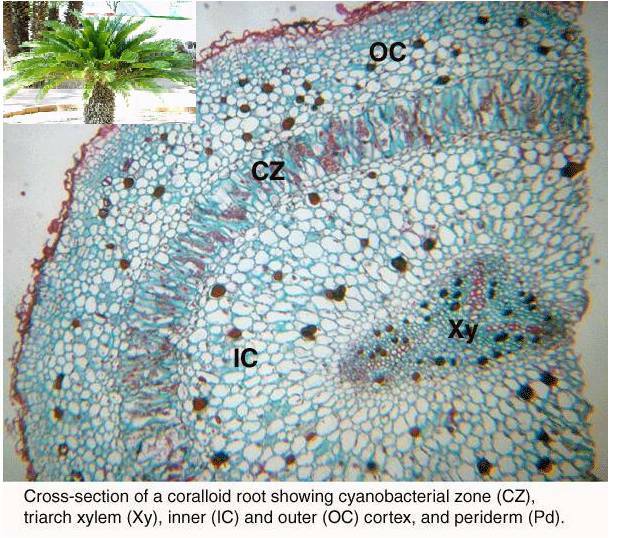 Development of vascular tissue : Xylem allows underground water absorbed by roots to be transported to the leaves and phloem ensures distribution of food manufactured by leaves to various plant parts. Development of cambium for secondary growth : This provides more mechanical tissues for support.